I just breezed out of beautiful Burlington, Vermont as the 2012 NEMA (New England Museum Association) wrapped up for another year. My big takeaway centered on all the session (and hallway!) chatter involving the issues and challenges regarding the increasingly greater inclusion of visitor input into museum exhibits and programs. Certainly fostering cultural organizations that are more responsive to, and inclusive of, the many different communities that interact with each museum is important, but I was struck by an odd little nuance during many of the conversations in Burlington. So many NEMA folks seemed hesitant (or downright ashamed) of sorting/curating/editing the vast piles (physical and/or digital) of visitor-generated content they were gathering. 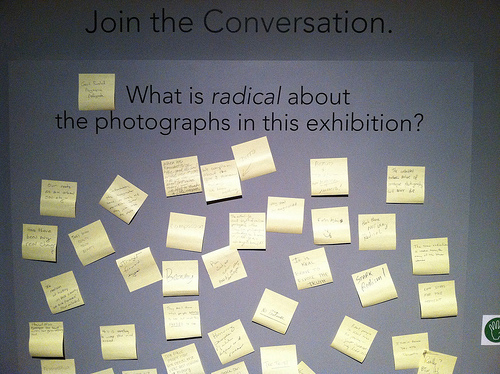 Somehow it seemed that unless many square feet of inane sticky note comments weren't allowed to remain posted at "Talk Back" boards across New England's museums, we were inherently insulting (or censoring?) visitors by sorting and organizing more meaningful comments for display. The "signal to noise" ratio at most of these comment boards really makes me question if this technique is becoming a painfully overused cliche akin to mini grocery store exhibits inside Children's Museums. Crafting careful "prompts" or thoughtful questions that elicit more than repetitive and banal responses from visitors can be tough. But why bother to even waste the sticky notes if you're only going to ask such overly open-ended questions as: "Tell us about your favorite memory about (insert exhibition theme here)?" If you do come up with good questions for visitors to answer, have you provided a comfortable environment where they can focus a bit to produce a thoughtful answer? Or did you just slap up a board on a wall right in the middle of a bustling exhibition gallery? Again, why waste the sticky notes if you've set up the situation to realistically produce only the most cursory, dashed-off comments? The first compared visitor comments and community contributions to a museum's physical collections. Curators care for physical collection objects and keep them, but museums only put their most interesting, most significant (perhaps even most upsetting) things on display, not everything! Shouldn't we treat visitor and community contributions in similar ways? The second analogy compared the role of museum staff to that of a conductor with an orchestra or choir. You keep things a bit organized, and let individual contributions shine through, but you also help prevent everything from completely going off the rails. It's important for community members to feel that their contribution "counted" but you can do that in many different ways. I thought the analogies neatly balanced both sides of the visitor contribution "coin." One focused on careful curation and sorting, the other allowed for the recognition a broader collective effort. I'm glad that the opportunity to interact with colleagues from around the region during the NEMA Conference got me to think more deeply about this topic. What do you think? What techniques have you used to "orchestrate" thoughtful visitor and community input? Let us know in the "Comments Section" below.